TURQUIE – Klaros - A number of interesting artifacts have been found this year in İzmir’s Klaros, the oldest of the three most important oracle centers in antiquity. Professor Nuran Şahin, the head of the Klaros excavation and a member of Ege University’s Classical Archaeology Department, said they had discovered a number of interesting artifacts in Klaros, the oldest of the three most important oracle centers in antiquity. People with Pagan beliefs would visit oracle centers to inquire God’s messages about their personal lives as well as problems about their province and country. Şahin said the dominant belief at the time was that bad luck would be summoned if one did not consult with the oracles when establishing a new city or making an important decision about the country. Klaros was founded on top of a fountain of boiling water and in the middle of an area surrounded by laurels. Oracles would be brought there in darkness and away from all human contact; they would transmit the incoming questions to God and the answers to the clergy, according to Şahin. “In this oracle center, which is dedicated to Apollo, the god of prophecy, representatives from delegations that governed the cities asked questions. When oracles came out of the room where they had fasted for 24 or 48 hours and where water was consistently boiling, the clergyman whispered the question in one oracle’s ear. The oracle then entered back the room, broke the fast, washed his hands and face, and asked the question to God. He later told the answer, which he received through inspiration or revelation, to the clergyman. Those answers that were about cities and countries were inscribed on tablets, and the tablets were erected in front of the temples,” he said. After conquering Kadifekale, Alexander the Great also consulted with the Klaros oracles about a dream he had when sleeping under a tree in the region. Legend has it that the answer Alexander received was that the happiness and wealth of people of İzmir would quadruple once they settled around the Pagos Mountain, alongside the holy river of Meles. Upon this answer, Alexander established the city of New Smyrna in the place described in the prophecy. Şahin said oracles were not usually clear in their prophecies and that many representatives had to come over and over again to clarify their answers. “Among the most ardent visitors of the oracle center were the representatives from İzmir. In that region where earthquakes had frequently occurred, one of the biggest questions was about earthquakes. As we understand from the tablets, representatives from İzmir would come to the oracle center after every earthquake and ask such questions: Will it happen again? When will it be? How many people will die? Will there be any plague or conflagration? Since wrong answers to these questions would damage the reputation of the oracle center, the answers were always ambiguous. Beginning with the questions that came after the earthquake in 152 B.C., oracles always responded that God is angry with such kind of questions and refuses to answer them. Apart from the destructive power of the earthquakes, important aspects of the cities’ struggle with disasters in the past were rodent invasions and plagues that followed them,” he said. With the spread of Christianity in the fourth century A.D. the oracle center fell out of favor, Şahin added. The reason that the heads of monuments found in the oracle center were missing could be explained by the fact that after Christianity’s chiding of such places, the monuments were demolished. BANGLADESH – Dhaka - Saat Gombuj Masjid, a historic seven-domed mosque in the capital, bears the scars of “ill-conceived renovations” by the archaeological officials and mosque authorities, who brought changes to its original design over the years. The mosque’s original colour pale red was changed to white about a decade ago, and several other changes were made on various occasions. Sources said, the colour was changed when the department of archaeology, which is responsible for conservation of archaeological sites, took up a project to renovate the mosque in 2003. Later, in the last fiscal year, the government took up another project to make a few more repairs, including changing the mosque’s damaged plasters, and restore it to its former look. Dr Ataur Rahman, current regional director of the department of archaeology, said the plan to change colour was “ill-conceived” and “wrongheaded.” “The then director of the department is responsible for making the change. We are now working to restore the originality of the architectural monument through a Tk1m renovation project that would finish by this fiscal year.” Apart from the colour, the management committee of the mosque incorporated several changes in its design, including constructing a washroom with tiled floor and sidewalls and modern toilet facilities. Such changes, Ataur said, may add up to a gradual process of distortion of archaeological sites, which require proper awareness of common people and proper renovation by the authorities. Prof Muntassir Mamoon, a professor of history at the University of Dhaka, said the mosque, judging from its stylistic patterns, was supposedly built during the reign of Subahdar Shaista Khan, in 1680. Sources said, the Buriganga River used to flow past the mosque when it was built, on a beautifully landscaped land covered with forests. With time, the river changed its course and now flows off one kilometre west of the mosque. Saat Masjid is about 38 feet long and 27 feet wide and the thickness of its walls measures four feet. In recent times, the authorities lengthened the prayer hall by making canopied rooms at the front side, to meet the increased pressure of prayer-offering people. There are three large onion-shaped domes placed over the main prayer hall and four small ones on all four corners of the rooftop hence the name Saat Gombuj Masjid (seven-domed mosque). BANGLADESH – Kuakata - The department of archaeology is going to build a museum in Kuakata to preserve a historic 200-year-old wooden boat discovered last year, hoping it would “improve” the region’s tourism potential. 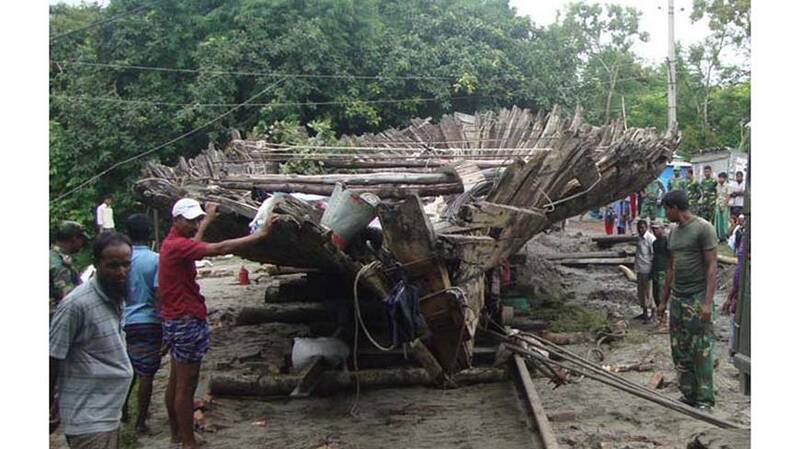 The boat, made from Gorjon tree timber, is believed to have carried the first generation of Rakhine settlers – an ethnic minority displaced from Myanmar – more than 200 years ago. It was discovered during a low tide on June 29, 2012 and is 72 feet long from one end to another, 22.5 feet wide and nearly 90 tonnes in weight, sources said. On July 11, 2012, a three-member team of archaeologists from the Khulna office of DoA examined the boat and confirmed that it was used by the first Rakhine settlers fleeing their home state. ROYAUME UNI – Hanson Brickworks - A plea to put Whittlesey on the tourist map has begun with two councillors who hope to bring an historic bronze age log boat to the town to be exhibited for free. The plea is part of a wider campaign to make sure Whittlesey does not lose out to Peterborough when it comes to promoting events like the Straw Bear Festival and the Whittlesey Summer Festival. Eight log boats, unearthed at Hanson Brickworks at Kings Dyke two years ago, were taken to Flag Fen, Peterborough, where visitors have to pay to get in. Two councillors say it is wrong that you can travel to London and get in attractions like the Science Museum and Natural History Museum for free and yet local history has been placed in a venue where people have to pay to see it. They hope to bring at least one of the log boats into the town where it can be displayed in either the museum or library. USA – Jeffersonville - Remnants of Indiana's first state prison (from 1822 to 1847) and other artifacts dating to the state's early years have been uncovered as part of a project to build a bridge linking southern Indiana to Kentucky. The discoveries include flint used to ignite Revolutionary War-era rifles and foundations, trash pits and drains associated with the penitentiary, along with animal bones that are believed to be from food fed to prisoners. Rick Jones, Indiana's state archaeologist, said it's unusual to find artifacts that haven't been disturbed by later development. A trash dump, houses and other buildings were eventually built on top of the prison site.